Why are some estimates so cheap? 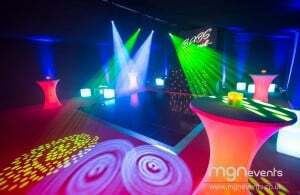 No, modern marquees can be erected on any surface, provided there is some means of anchoring. Undulating surfaces can be tackled with a standard boarded floor, slopes and troughs will require an integral raised floor. Can you put a marquee on a tennis court? Yes, tennis courts are an ideal space, though the surface can sometimes get marked and netting needs to be removed. A wooden floor may necessary to protect the surface and assist drainage. Not really, except on soft, wet lawns where the entrances and exits can become soggy where it is well trodden. We advise a wooden boarded floor in these kind of conditions. There is generally just a slight yellowing of the grass, which quickly grows back. We recommend cutting the grass a couple of days prior to the arrival of the marquee to allow it to dry out.The aim is to erect the marquee on a dry surface to limit condensation and damage to lawn. How long have Inside Outside been providing Marquees in Surrey? We are proud to have been trading for over thirty-five years. Does Inside Outside only provide luxury marquees? 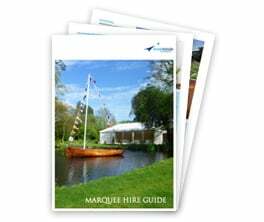 We offer a range of marquee packages individually tailored to your needs. We have options from budget tents and unlined traditional poled marquees to state-of-the-art frame tents, suspended flooring and bespoke linings made to order. 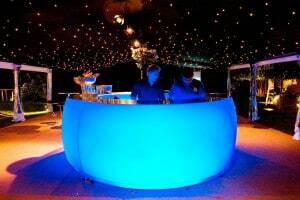 What makes Inside Outside Marquee Hire unique? Attention to detail. We understand the importance of precision and workmanship, which naturally leads us to make our own canvas poled marquees and beautiful and elegant linings in a range of colours and styles. 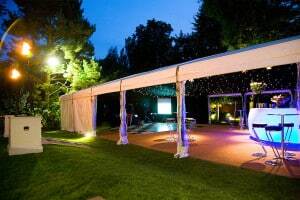 Our versatility and can-do approach has given us the reputation of being the leading marquee hire company in the South East.